I always loved ice-cream cones and craved them ever since I gave up grains and sugar. 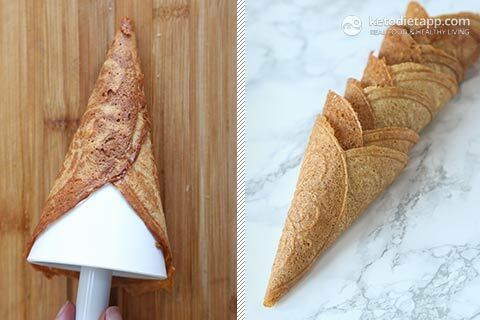 I know how to make keto ice-cream, grain-free bread and even low-carb tortillas, but it just seemed impossible to make sugar cones — after all, the main ingredient is sugar. After experimenting with different nut & seed flour mixes and sweeteners, I came up with this recipe. 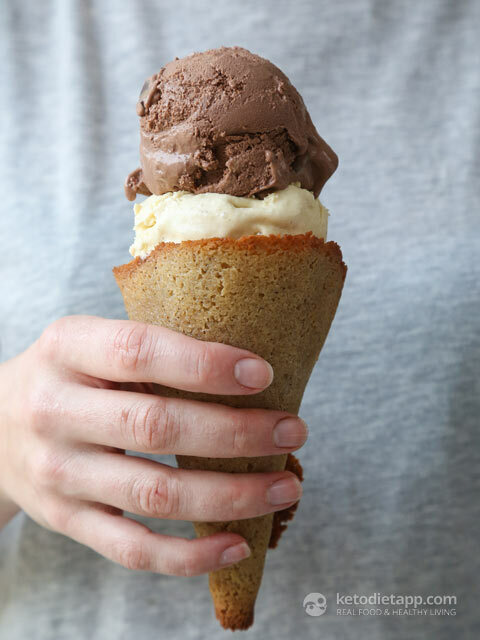 These cones are guilt-free and very likely the closest you will ever get to real sugar cones! There are two ways to make them. You can either use a cone maker, or make your own cone shapers and bake the dough in the oven. 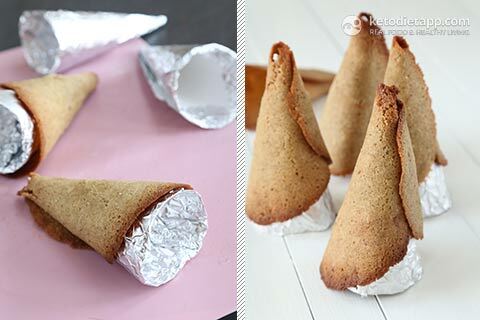 I prefer using the cone maker (just like in the video recipe below) because it&apos;s less work, it&apos;s easy and you can make the cones really thin and crispy. Preheat your cone maker to medium (here&apos;s a good cone maker on Amazon). 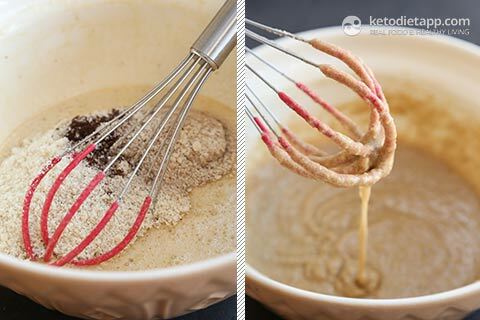 In a bowl, place the almond flour, psyllium, vanilla powder and salt. In another bowl, mix the eggs, coconut milk, sweetener and melted ghee. 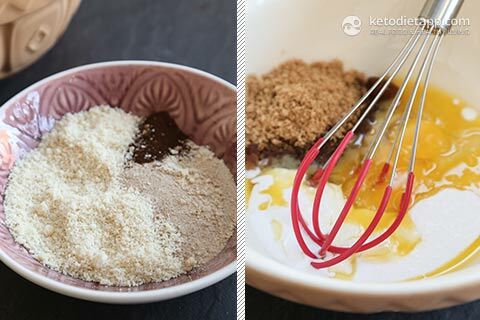 Add the dry ingredients into the bowl with the eggs and mix well. Pour the batter (about 3 tablespoons per wafer) in the cone maker and close the lid. Cook for 3-6 minutes, or until it&apos;s lightly browned and cooked through (the time depends on the cone maker and temperature setting). Once ready, use a spatula and cone shaper to fold the hot wafer around it. Place on a plate or a chopping board and let it cool down for 1-2 minutes. As it cools down, the wafer will harden. Then, you can remove the cone shaper and let it cool to room temperature. Repeat for the remaining cones (9-10 per recipe). Once cooled, place them gently one inside another and store in an airtight container for up to a month. 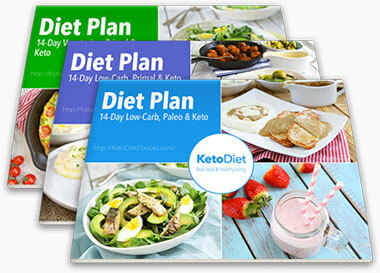 Serve with a scoop or two of your favourite keto ice-cream - there are plenty of recipes on my blog. 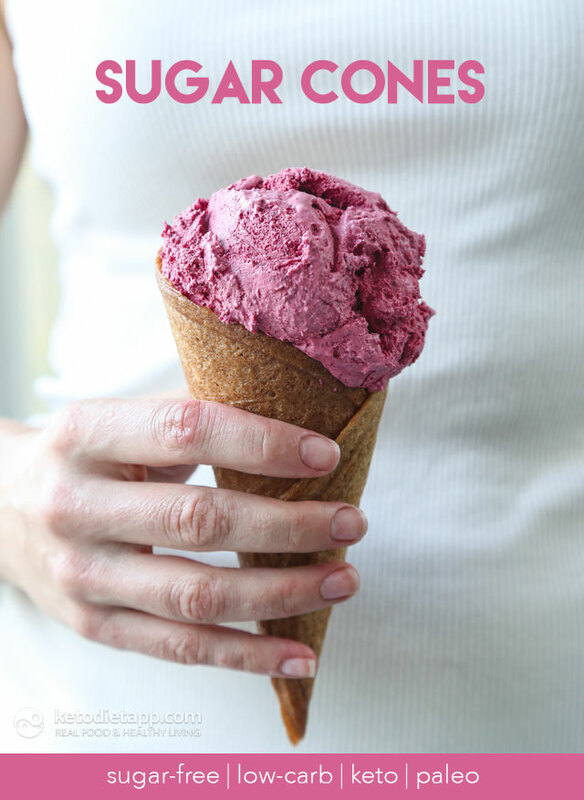 The pictured ice-cream is a variation of my Fat-Burning Berry Ice-Cream from the KetoDiet App. 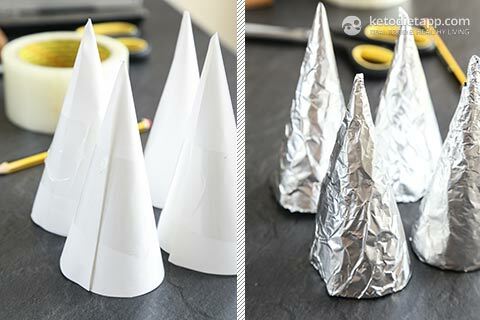 First time I made these sugar cones I didn&apos;t have a cone maker and used DIY cone shapers made out of paper and aluminium foil based on this tutorial. Then I used a proper cone maker and the result was so much better. I wouldn&apos;t go back to using my DIY approach! It&apos;s simply too much work and the result is not worth it. The cones were thicker, unevenly cooked and as a result slightly burnt on the edges. If you decide to give the DIY approach a try: Once you make the cone shapers, spread the sugar cone dough in round shapes on a silicon baking mat and bake them at 150 °C/ 300 °F for 15-18 minutes. Once ready, use a spatula and your DIY cone shaper to fold the hot dough around it. Place on a plate or a chopping board and let it cool down for 1-2 minutes. When done, fill with your favourite ice-cream like (mine is the Ultimate Keto Chocolate Ice-Cream and No-Churn Vanilla Keto Ice-Cream). Hi! 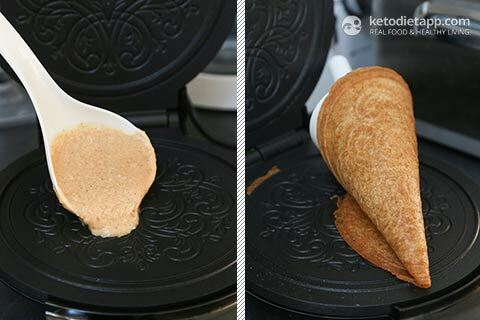 I clicked on the link for the cone maker but it takes me to a krumkake maker- which appears to make the same design as the one in the directions but much smaller. I compared cone pictures of both krumkake maker and the waffle coneexpress maker and the waffle cone ones resemble your cones but they have no design- just plain. Which one do you recommend? Can I use a Pizzelle maker for these? It looks like the cone maker to me, but I'm not sure. Thank you. Interesting post. but just wondering if these cones r soft like our usual keto bakes or are they crispy like normal cones? Can you use a waffle maker? I don't think so because the dough would be too thick - you need to spread it out thin. These look awesome! Just curious, if I were to use Swerve/Erythritol, should I use granular or powdered? Thank you! I tried both and found no difference so you can use either. If you substitute, make sure to go by the "gram/oz" values as 1/2 cup powdered sweetener will weigh less than granulated. I made these, and they are delicious - thank you! However, I found just one tablespoon of mixture was plenty for each cone - and I made 8 cones - so I am puzzled how you could make 9 - 10 using 3 tablespoons per cone . . . . Of course my machine may have been a different size, but judging from your pictures, they look about the same size. I made them as a special treat for a birthday dinner - everyone loved them! Sadly, Surkin Gold has MALT in it which comes from BARLEY. We do not eat any grains in our house. Have you found any other substitutes for the molasses/brown sugar flavor? Hi Robin, as far as I know, Sukrin use gluten-free malt extract from corn (not barley) so it shouldn't be an issue. Or you could use Erythritol or Swerve instead. 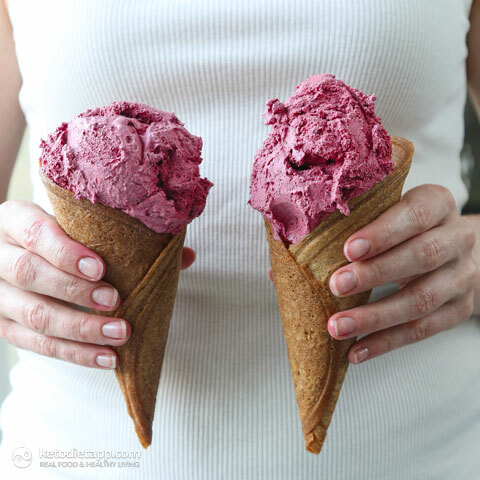 I just tried making these and the flavor is awesome, just like regular cones. However, they were so lacy that I couldn't keep them together. Any suggestions? That's odd. I wish I could help but I didn't have the same issue. Did you se any substitutions? I also had lacy cone on first attempt and realised it was because the batter was too thin. I did add another 1tsp of psyllium powder but I on hindsight I don’t think you need it. You just need to let the batter set up for a few mins to become thick, because then I had no issues with lacy cones after that. Thank you Mel, that could be it. Thinking about it now it may have taken about 5-10 minutes before I made them because I was also taking photos. I really love your recipes!, I wonder if you added cocoa powder or dark chocolate for a chocolate cone?. Thank you Kelly, yes, that's an excellent idea! 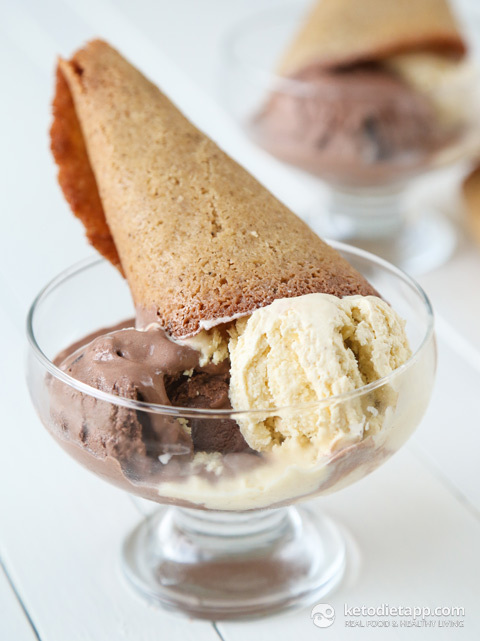 For a chocolate cone, I'd add 1-2 tablespoons of cacao powder and use just about 1/2 cup of almond flour. They're called cream horn molds. Maybe you could invent some ketofied cream horns--then you'd have walking taco dinner and cream horn dessert! I actually have those and I do need to make some keto cream horns!  I originally bought them for making the cones but they were too narrow. Ever hear of "walking tacos"? That's a cone-shaped tortilla with the taco filling inside, instead of a sweet-ish cone filled with ice cream. 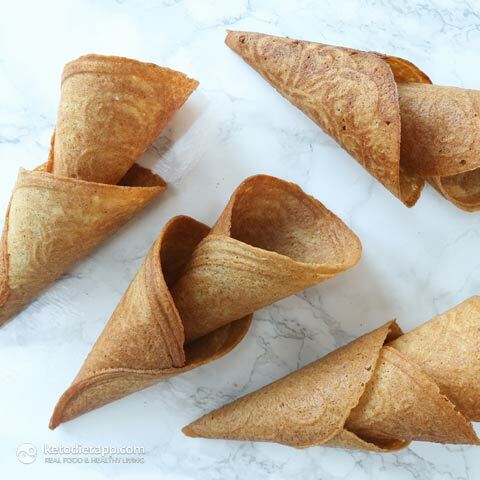 If you were to take your existing recipe above, and substitute chili powder (or some other savory spice) for the cinnamon, and maybe garlic puree for the vanilla, then fill these cones with taco filling, you'd have one! Sugar cones? Whaaaat? I just cried like a baby! Seriously I can't thank you enough! This is my dream come true!! !